Three separate radical Islamic terror attacks took place Friday in Europe. The most serious was caused by an improvised explosive device (IED) placed on a London underground train in the Parsons Green station which injured more than 30 people. 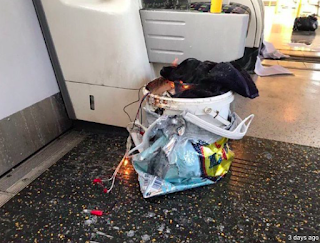 Witnesses spoke of hearing a "whooshing" sound and then seeing a fireball coming at them from a plastic bucket that was placed unattended on the floor of the rush hour train. The device's failure to completely detonate was credited with saving lives. "There is no doubt that this was a serious IED (improvised explosive device) and it was good fortune that it did so little damage," said UK Interior Minister Amber Rudd. Two men, ages 18 and 21, are in custody. ISIS has claimed responsibility for the attack. Until the second suspect's arrest Saturday night, Prime Minister Theresa May raised the terror threat level from severe to critical, meaning that future attacks may have been imminent.